Continuing on with our Project Relaunch focus on changing the world, we’re keeping our attention on Nehemiah, the expendable cup-bearer who re-shaped his civilization. As Nehemiah made his proposition for rebuilding the temple to the king, he presented his plan with confidence because his mission was clear and his planning research was thorough. The first characteristic essential to loosing the world changer in you is clearly defining your mission. What aspect of the world are you changing? Once your mission is defined, choosing your methods is next. World changers make their plans wisely and execute them with confidence. Finally, the people who change the face of history inspire people passionately by their work. The efforts of world changers work themselves out of a job by inspiring their successors. Today’s drawing is a narrative that presents the ideals for what it takes to release the world changer inside you. As we studied Nehemiah’s situation, the attitude of his peers first grabbed my attention. The king gave him permission to carry out his mission to rebuild the temple and collaborated with surrounding kingdoms to support Nehemiah’s efforts. The majority of the push-back and criticism Nehemiah received came from the community where he lived. The resistance to the temple being rebuilt was not the result of controversial public policy or disputes over property values, it was a simple question of why. The temple existed in its ragged state for so long, it’s purpose for existence faded. People viewed Nehemiah’s efforts as futile. Despite sustaining blows to his esteem, Nehemiah’s passion drove him forward. The apathy of the community toward the temple reminded me of a familiar object lesson. How does one boil a frog? Place the frog in a pot of cool water then slowly apply heat until the water boils and the frog cooks. By raising the temperature slowly, the frog adapts to its surroundings without sensing any danger and will remain submerged as the water reaches it’s boiling point. 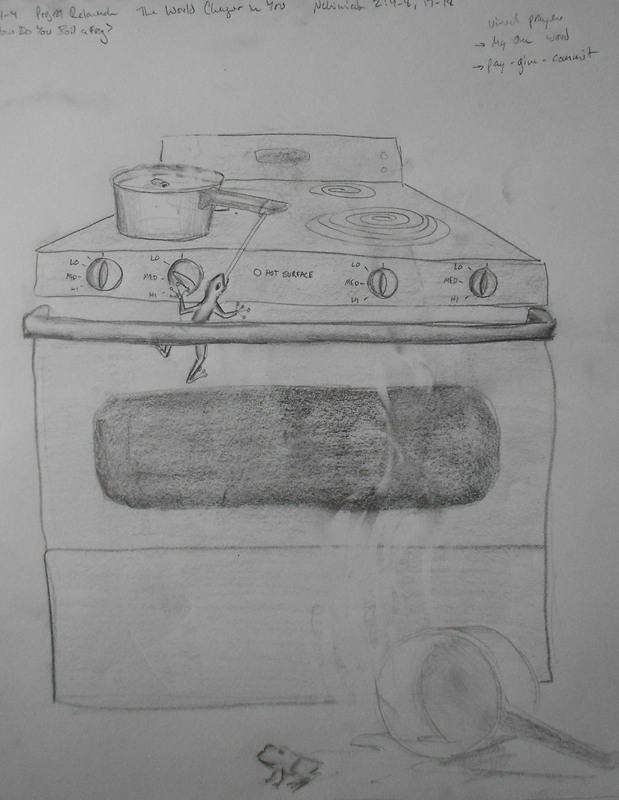 One frog in the drawing is rebelling against its amphibian peers, stepping out onto the stove. Having realized his narrow escape from the impending doom the others still face, this frog returns against the odds to free his friends. Using the suction quality of its hands, the enlightened frog turns off the heat. Though safe from a boiling demise, the remaining frogs still lack the motivation to escape their pots. Making good use of the strength of his tongue, the passionate frog strikes the handles of the pots confining his friends, wraps the handle in a strangle-hold, then leverages himself to overturn each one. Freed from his watery prison, one bull-looking frog sits on the floor. From his vantage point, he can see what he’s been freed from, others that are still confined, and the one working to free them. Inspiration to participate with the change is sure to follow. World changers inspire people passionately, even if the object of their passion is unpopular at the time. I recently listened to a sermon about the prophet who came right before Nehemiah (I think). It was about being broken for your entire nation of people, seeing that they were without God and they didn’t even care. The end of the 70 yrs of captivity were almost up, and he covered himself with ashes because no one wanted to leave. It makes me wonder how much of culture I’ve just become apathetic to. This line alone speaks volumes to the state of our society (which also seems very similar to the popular thinking of Old Testament Jerusalem).